For years I had been dreaming of visiting Karaikudi and one of the things I knew the town was famous for was the Athangudi Tiles. After the morning visit to the two famous temples in this region, I quickly asked the cab driver if he knew where we could see these tiles being made. He took us to the one factory that has withstood the test of time and popular in Athangudi village of the Chettinadu region. Dropping us off he asked if he could quickly go have lunch and come. We happily agreed and wandered into the factory premises. On our left were two large ponds filled with water and tiles in them. On the other side was a building with 4-5 people busy packing the tiles. They seem to work mechanically as if this activity was something they could do with their eyes shut. There was a lady amidst them and she said she too had been working in this industry for over 30years. They worked with their hands, no gloves, no face masks, no ventilation but the open and did not wear any protective gear at all. This was what caught my eye first and I felt bad for them. Using their bare hands to pick up the glass tiles, pack in the concrete, set it in concrete before stacking it up to dry was no easy task. There was an inner area, a long corridor of sorts where 2 men sat doing similar work. 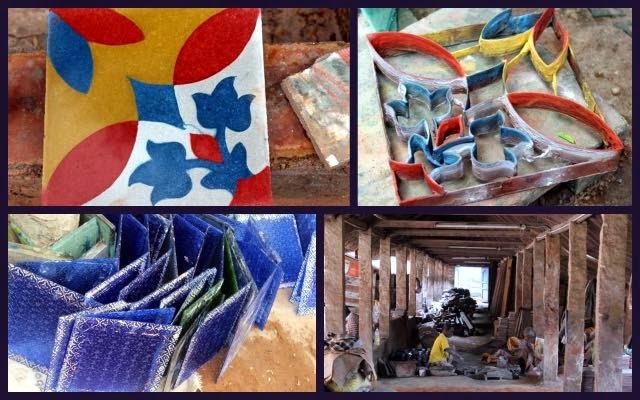 The only difference was they were creating tiles that had varied patterns and colours, they had a metal mould of sorts that they used to fill in the colours. All the fancy windows we see in old homes are all made right here in this small place. 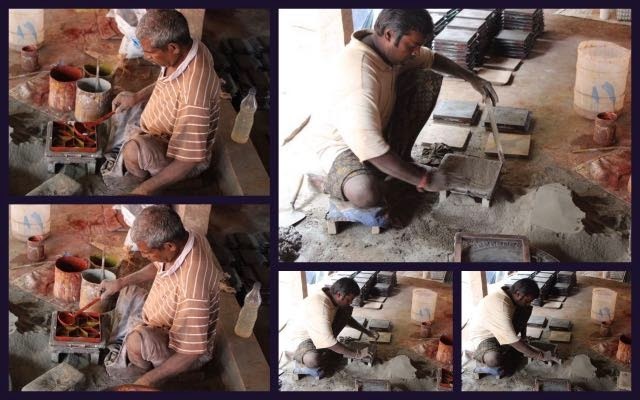 One of the men was quite old, said he had been trained in Ambasamudram [another small town in TN which was renowned for tiles] and then had moved here to work in the factory. The mix of cement and coloured oxide in a liquid slurry state is individually poured into patterned moulds upon a glass piece. A thin layer of local sand is laid; the tile is then filled to three-fourth inch thickness with cement, sand and small stone aggregates or jelly to get the tile. It is cured in water for a minimum of 21 days and readied for laying. Imagine, all this is done to every tile individually, building up an amazing handicraft industry. 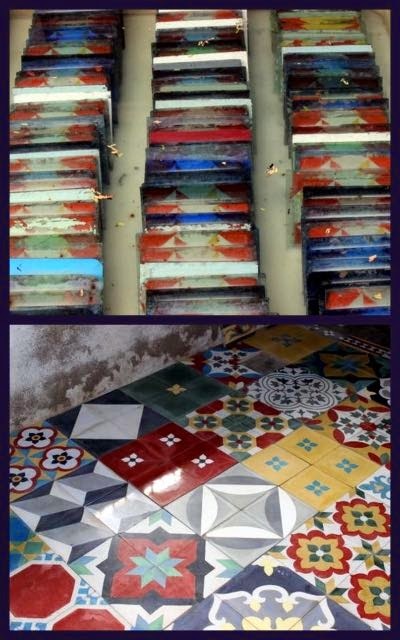 While the red colour tiles look like red oxide flooring, varied geometrical and floral patterns are also available. The traditional patterns are still being continued with, hence Athangudi tiles are among the few choices available today to create an ethnic ambience. However, unlike red oxide, these tiles come with greater smoothness and shine. In designs, finish, quality and durability, Athangudi can compete with any of modern manufactured flooring materials, of course with its own advantages and disadvantages. Used in the right place and context, Athangudi tiles are among the sustainable solutions ahead of us. We spent about an hour here, talking to the people and to the man who ran the factory. He shared that the tiles were popular with city dwellers even today. Some came all the way to hand pick the tiles. The price was around Rs45-50 but lesser if bought in large volumes. We did notice that almost all homes in the region had these beautiful tiles all over. We did deliberate about buying a few, but decided against it as the tiles were heavy and had to be handled with care [we were travelling by bus]..
Nice to know more about these popular tiles. Thursday Challenge.. Zip zap zoom!